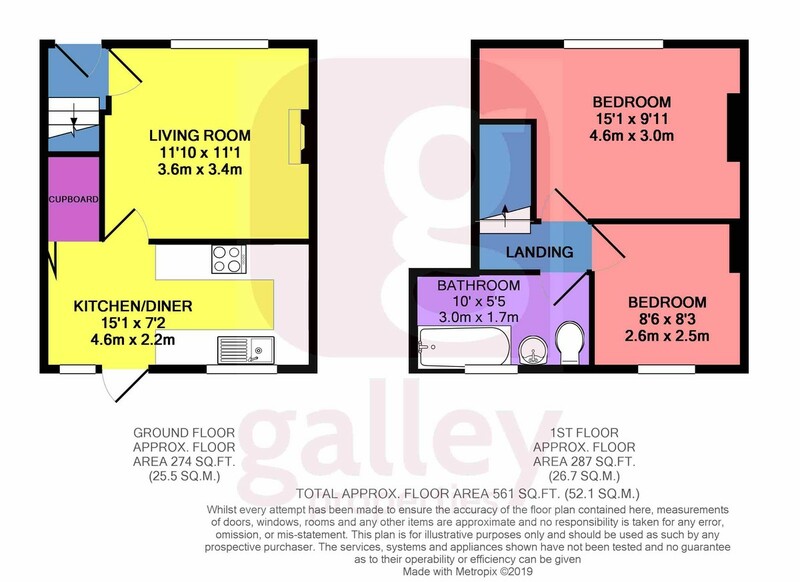 MAIN DESCRIPTION This great two-bedroomed terrace is the perfect property for a first time buyer or for the canny investor. Set on a quiet crescent in the popular residential area of Balby, it’s beautifully finished to a high standard. With new carpets and flooring in 2017 and a well equipped stylish kitchen, it’s just ready to move straight in to. Within easy reach of the A1(M) and the wider motorway network, and just a short drive into Doncaster, Balby is a perfect location. It’s also within walking distance of local shops and amenities, and near to several open green spaces. HALLWAY Through the half-glazed, uPVC double glazed front door this lovely compact entrance, with the door to the living room immediately to the left and carpeted stairs going up to the first floor. LIVING ROOM 11′ 9" x 11′ 1" (3.6m x 3.4m) Beautifully decorated in palest dove grey with white gloss woodwork, skirting boards and cornices, the living room is an oasis of calm and serenity. There’s a contemporary feature fire surround to provide a stylish focal point, central ceiling light, tv aerial and power points. A co-ordinated grey carpet compliments the colour scheme and there’s a radiator under the window which over looks the front of the house. Another doorway leads through to the kitchen/diner. KITCHEN/DINER 15′ 1" x 7′ 2" (4.6m x 2.2m) The walls in here echo the soft grey of the living room, and the floor is a hard wearing, dark grey, tile-effect laminate, which matches the tiled splash backs around the black, granite effect counter tops. There are plenty of cupboards and drawers, all fronted with Shaker-style walnut doors and chrome handles to provide lots of storage. A one-and-a-half bowl stainless steel sink with arched mixer tap sits under the window which looks out over the back garden. The sleek, black induction hob has a contemporary stainless steel extractor hood above and a black and chrome fronted fan oven beneath. There’s plenty of counter space for the keen cook to make the most of, all amply lit by the under cupboard spotlights. The integrated fridge and freezer also means there’s plenty of space for a table and chairs next to the radiator under the other window. Beneath the stairs is a very useful storage cupboard as well. This really is a great kitchen and makes the most of the space available. BEDROOM ONE 15′ 1" x 9′ 10" (4.6m x 3.0m) The front room benefits from a soothing, neutral colour scheme, and was also re-carpeted in 2017. The door, gloss work and skirting boards are all white, and the overall effect is really relaxing. A central ceiling light, radiator and power points complete the space. BEDROOM TWO 8′ 6" x 8′ 2" (2.6m x 2.5m) The rear bedroom has a laminate floor and a very nifty built-in wardrobe, complete with shelving and a mirrored door. The window overlooks the back garden and there’s a central ceiling light, radiator and power points in here too. It’s decorated in the same neutral colours as the front bedroom. BATHROOM 9′ 10" x 5′ 6" (3.0m x 1.7m) With its white suite, cushioned wood-effect vinyl flooring and pretty mosaic tiled splash backs, this spacious family bathroom has everything you need. There’s a white low-level WC, pedestal wash basin and panel-sided bath, as well as a built-in airing cupboard for all those sheets, towels and linens. Above the radiator is a perfectly placed towel rail too! EXTERIOR SPACE FRONT GARDEN The front of the house is laid mainly to concrete, with a central flower bed planted with mature Japanese black grass. There’s a brick wall set with a wrought iron gate off the pavement, and an additional iron gate at the entrance to the ginnel which leads through to the back garden. REAR GARDEN Stepping out of the back door from the kitchen/diner, there’s a small concrete patio that provides space for garden chairs and wheelie bins. The back garden is mostly grassed, with a narrow flower bed along the northern fence line. At the bottom of the garden is a fetching deck area, complete with wooden balustrade, tucked next to a very useful garden shed.